ONLINE EXCLUSIVE AT NET-A-PORTER.COM. 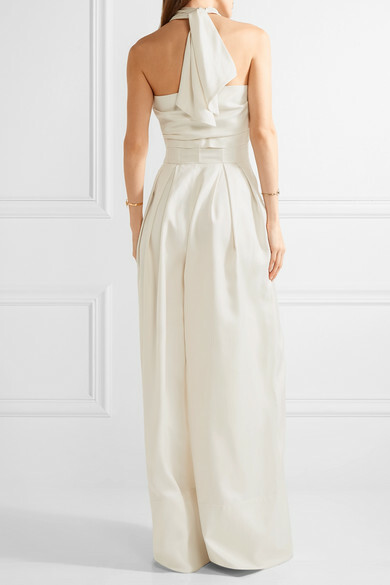 Rosie Assoulin's jumpsuit is part of our exclusive bridal edit. Made from wool and silk-blend satin-twill, this halterneck design has ties that wrap across the bodice and create a front cutout. The heavily pleated high-rise waist extends to dramatic wide-leg pants. Sweep your hair back and style it with gold accessories. Shown here with: Chloé Shoulder bag, Jil Sander Sandals, Cornelia Webb Ring, Cornelia Webb Cuff, Isabel Marant Bracelet.